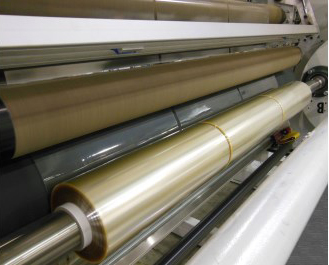 Canada-based Macro Engineering & Technology Inc. announced that it has upgraded the high-speed cast line for producing PVC cling film to boost output by more than 20%.The new 2m wide line features an extrusion output of 300kg/h (up from 230 kg/h in the previous design). It produces strong film from 8-16 microns thickness that can be used in both hand-wrap and machine-wrap applications. A key feature of the redesigned line is the new winder, which operates at speeds up to 280m/min. The winder is a specially designed two-spindle contact version that creates elevated contact forces to generate rolls that are transparent and with uniform geometry.The cutover sequence on the new winder has also been improved to drastically minimize scrap during roll indexing. When fully equipped, the line is supplied with auxiliary roll edge cutter, resin blend preparation system and recycling system. PVC cling film is popular for such applications as meat, poultry, cheese and vegetable packaging applications. The film’s stretching properties offer good food presentation on the shelf and it clings well onto many surfaces.